The Art Conference (TAC), brought together a programme of 15 international keynote speakers from the worlds of technology, art and culture and transformed The Ugly Duck, a three-storey 19th century warehouse, into a buzzing social engagement all with an interest in the future of this artistic global movement, and the role technology has within this exciting scene. The web and social media has greatly influenced the street art movement, it has played a vital role transporting street artists murals around the world, overtaking the trains of the NY subways with such a velocity catapulting their artwork to the masses… but what else is there to push this phenomena further, how can the artist connect more with their audience, and what does the future for art hold? Tina Zielger, curator of TAC, challenges this dialogue and invites us to explore the evolution of street art with a curated weekend of keynote presentations and panel discussions, with a focus on art and new emerging technologies. Many artists have been experimenting with GIF, augmented reality and virtual reality pushing their art towards a future medium, and welcoming the advances in technology. New yorker, Jordan Seiler opened TAC with his thoughts and activities on public advertising and his use of Augmented Reality within his campaigns. Firstly Seiler brings to our attention that if you live in a major city, your eyes are literally currency. In Seiler’s eyes we are experiencing ‘Visual Pollution’. Wherever you look agencies are turning public spaces into advertising. This is what the Public Ad Campaign hopes to fight! and Seiler has created an app called Public Ad Campaign where you can turn all the corporate advertisements into artworks… genius! His ongoing ‘Collisions’ series uses simple graphic patterns to create advertisement takeover environments. Each image once photographed triggers an Augmented Reality component viewable through the PublicAdCampaign mobile app available on Android and iOS devices. This is so crazily brilliant you can bring a static advert to life, and view its story! The initial exploration of Augmented Realities ability to function as a meaningful ad blocker in public space by Seiler was in 2011 known as NO AD, a subway commuter app that turns NYC subway platform advertising into artwork, making the entire NYC subway system an unauthorised gallery. During Q&A Jordan Seiler was asked by the audience, has he now swopped brand adverting for artist advertising? His response was “It is our choice to download the app”. His passion and enthusiasm is contagious! Another war on advertising comes from Scottish artist Robert Montgomery who hijacks large billboards and back-lit bus stops to share urban poetry with the world around him. His elegant verse is presented in white typography on a black background, or site-specific installations created from light and text, that address universal themes about consumerism, hypocrisy, Power, love and many other things. Unlike Jordan Seiler he also works with companies to place his work, however their mission remains the same… providing an alternative voice to the aggressive commercial advertisements that are uninvited and intrude on our day-to-day life. Instead of billboard takeover, Brooklyn, New York based artist Dan Witz spoke to us about his ‘Breathing Room’ project that will see him take-over the London city’s red telephone boxes with an illusionistic painting of a person, of all cultural backgrounds and faiths, all in the midst of spiritual practice, and all projecting a quiet sense of inner peace, such as a young Buddhist boy, a hijab-clad young woman and a Hindu yogi. The new project is an extension of his past activism with Amnesty International in which the imagery in the phone boxes were planned to further broadcast the plight of tortured and wrongly detained political prisoners across the world. However, the recent terror attacks in Europe have had a profound effect on Dan Witz. Another artist incorporating the latest technology into his artwork is emerging Mexican photographer and visual artist, Jose Montemayor. He presents Virtual Awakening, an immersive, life-after-death virtual reality experience. Jose Montemayor believes death is only the beginning, like his photography, he brings the darkness out of dying, always striving to find the light. He uses Virtual Reality to show dying as our last adventure, providing a platform to promote change, and broaden our perspectives. In his mind-blowing 15 min video users wear VR headset, and allow Virtual Awakening to take you through the experience of dying and coming back to life… but not as we know it! The planet is portrayed in a very different light raising awareness of environmental pollution and its consequences. Jose is hoping to evoke empathy and enlighten his audience to promote change. A fantastic and intriguing concept from this young artist. Dan Lewis talks to us about ‘Skute‘ new technology and a new kind of network. He describes it as a physical network, with you in control. Unlike all the other networks out there, to be part of a Skute network you have to physically touch. Make a real connection, in the real world, encouraging the outdoors! You can upload whatever you want onto your Skutes, and share it with whoever you like. The skute pods are a great way to share content, you can stick it to a wall uploaded with imagery where others can find it. They tap the Skute, watch the imagery , and can then add their own opinions to the Skute. Using the app you have full control of the Skutes you create or the ones you discover. Rj Rushmore questioned the topic whether the future of street art has become more ‘Decorative than Dissident’. Is public art we are seeing more visually pleasing rather than art that creates opposition to authority. He highlights some thought-provoking street projects, such as Tatyana Fazlalizadeh ‘Stop Telling Women to Smile’ campaign, and Michelle Ortiz mural with a focus on deportation on the street in front of the Immigration and Customs Enforcement building in Philadelphia, Also Chang ” Before I Die’ project, and how public art should fit within the settings, such as Faith47 mural for Cities of Hope set within the LGBTQ community. He is not completely against Decorative, with reference to Coney island, he questions.. Proving RJ’s point was Mia Grondahl is a Swedish journalist who has lived between Sweden (Österlen) and the Middle East (Jerusalem/Cairo). She is the co-founder of Woman on Walls and has played an important role in Egypt to empower woman. WOW is a public art project in Egypt aimed at empowering women through the use of street art, by encouraging the portrayal of strong Egyptian female figures in street art, and empowering female street artists themselves to participate in the political space of graffiti. Building on the popularity of street art as a form of political expression during the January 25 revolution, the aim of this project is to increase awareness of women’s issues by introducing women into public space. Female street art also serves the purpose of spreading political statements against the abuse of women. In contrast to that we heard Teresa Latuszewska who spoke about the Urban Forms mural project in Lodz Poland . 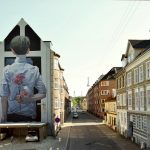 Teresa established Urban Forms Foundation in 2008 when she was inspired to turn her city of Łódź, Poland into an outdoor gallery of murals and bring international artists to transform the face of the city. She has worked actively on aestheticising the public space and changing the social status quo through art. Teresa Latuszewska likes to include the locals about the art in their city. She carried out 500 interviews about how locals are affected by public artwork, learning people’s opinion and questioning should the people living in the area have more input? From the audit she found the locals like to be informed, listened to and decide on location. With regards to which artists to choose, she found they preferred the experts to choose. Even a brief conversation with an artist can deepen a collector’s experience of their art in a multitude of ways. Maser talk was just that, he gave a thoughtful insight to his journey as an artist, moving from graffiti writing into typography and how he likes to interrupt the landscape with his art. That said, relating to people at in large groups, is not easy for many artists and they not used to being the centre of so much attention. There were more interesting talks jammed into the two-day conference, and the speakers engaged the audience, it was a fun relaxed atmosphere, mixing the art conversation with a festival feel! a cold beer was welcomed on the hot weekend and a great vibe was felt throughout the two days. There was audience participation with on stage Q&A from the guest speaks, all perfectly orchestrated by Doug Gillen from FifthwallTV, bringing his warmth, humour and Scottish charm to TAC. On the ground floor of the building was a free exhibition open to all and managed by Olivia Skalkos, with artists such as Maser, Dan Witz, Lauren Baker, Jordan Seiler , Robert Montgomery, Jose Montemayor, Tinsel Edwards, Will Vibes, Colin McMaster and Mr. Penfold all showcasing their artwork. The conference encouraged conversation and debate on current issues such as how technology can enrich our experience with art and culture and to explore the evolution of street art as a global movement, the success of TAC was a diverse lineup of keynote speakers and a friendly and energetic team behind the scenes. Lets hope this is the first of many!